Average Health. Pysical and artistic. The ice is one I use daily and put under my ankle; I use the English Ice Cap on top. I wish I could wrap it around my ankle. I have a large size of this ice pack. Love it. This little one will be a good one to take on trips of when I have a small area. Emergency. Pain and swelling. Leg cramps. Following Surgery. Colpac is the best! There are substitute brands out there and I bought one thinking it would be the same...no way. Colpac stays colder and feels colder longer. You get what you pay for. Don't be fooled, stick with Colpac. I had a Total Knee Replacement and after standing for hours or just running errands I have pain and swelling. 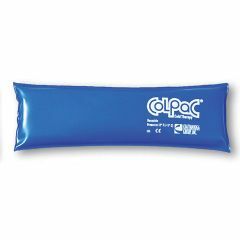 I use different Colpac sized depending on how much of my knee is having problems. Is cold only w/o cover.. I use the ice pack for my neck, my swollen feet and for a sprained wrist.